Shelter From the Storm, Stories of the Home and Hearth. While the footnote Maven Blog is not ready for prime time, I couldn't resist posting to the Shelter from the storm, stories of the home and hearth, 19th Carnival of Genealogy. My great grandfather, Louis Salter, his wife Julia, and their daughter Lillian lived in Carnegie Hall. Yes, that Carnegie Hall. So how did Louis Salter come to take up residence in Carnegie Hall? there was no central home for symphonic music. A young conductor, Walter Damrosch, convinced the philanthropic Andrew Carnegie of this cultural need, which lead to the creation of America’s most beloved institution, Carnegie Hall. In 1889, Carnegie formed a stock company, The Music Hall Company of New York, Ltd. He acquired seven parcels of land that created a square along the block of Seventh Avenue between 56th and 57th Streets. The streets were unpaved and the location, at the edge of Goat Hill, near Central Park, was so far uptown it was considered out in the sticks. 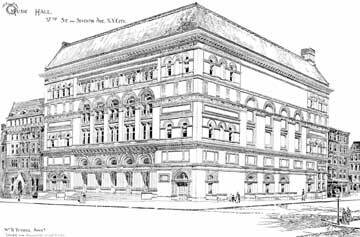 In 1890 the cornerstone was laid for The Music Hall at 57th Street and 7th Avenue. The first concert was a highly successful five-day opening festival held in 1891 and attended by the cream of New York society. One of the Music Hall’s first employees was a young apprentice electrician named Louis Salter. Of his career at Carnegie Hall he was quoted as saying, “I began at the top and worked my way to the bottom.” As an electrician, Salter had worked in the ceiling of the concert hall and at a very young age had assumed the position of the Superintendent of Carnegie Hall with an office in the basement of the building. Transportation to the edge of Central Park from the center of New York was difficult and certainly not fast. Telephones were a luxury, a luxury not afforded Louis Salter. So it was decided by the management of Carnegie Hall that Salter and his family would live in the Hall, so that Salter would be on premises for any and all emergencies. Where exactly the Salter family lived is not known. Gino Francesconi, the archivist for Carnegie Hall, believes the Salters lived in "the Gatehouse" on one of the original lots purchased by Andrew Carnegie. Our family believes the Salters lived in an apartment in Carnegie Hall itself. Lillian Salter told her children and grandchildren stories of learning to roller skate in Carnegie Hall and of charming many of the conductors that performed there. Ric Burns and James Sanders, et. al., New York An Illustrated History (New York: Alfred A. Knopf, 1999), 202. Peyser, Ethel, The House That Music Built: Carnegie Hall. New York: Robert M. McBride & Company, 1936. Architectural Drawing - Carnegie Hall, Music Hall: 57th St. and 7th Ave. New York: The Cherouny Printing and Publishing Co., 1891 - 1892.